Rainworth was originally a peaceful Hamlet on the road from Mansfield to Newark, consisting of a small group of buildings which included the original Robin Hood Inn – the Toll House, nicknamed the Inkspot. With no public transport the only way to get from place to place was to walk. 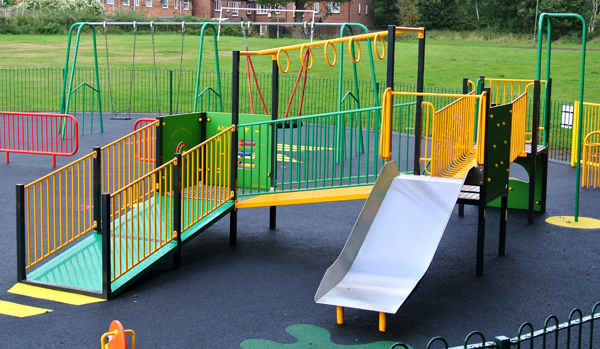 Since those early days many things have changed in Rainworth and the latest development is the refurbishment of the original play area on the open space on Southwell Road East. Working with Mansfield District Council, Play and Leisure has developed a new play facility to replace the old and tired play equipment. Funding was secured by Mansfield District Council following consultation with local children earlier in the year. The new £60k play area has been designed for children of all ages and moreover all abilities and includes Swings with Junior seats and a Basket, the NEW Storm Roundabout, Spey Activity Unit, Seesaw, Springy’s, a Wobble Surf Board and Interactive Play Panels including Drums. The surfacing also includes a variety of games and markings. Mr. Andy Chambers of Mansfield District Council was absolutely delighted with the finished play area and members of the school council at Heathlands Primary School tried out the equipment commenting on how vibrant, colourful and what great fun it was. Councillor Philip Shields, Portfolio Holder for the Environment said “the previous equipment was old and in a poor state of repair. This new equipment will provide children in the area with a modern high quality facility that will provide hours of free fun and entertainment”..